In honor of Bastille Day, as we Americans call the French national holiday, I figured I’d revisit Paris. For lunch. Alas, I am not getting on a plane. I’m just journeying through my notebook from last fall, from a drizzly October day. We come from the underground after touring Les Catacombes and emerge on a bleak Paris street beneath a sky that reminds me of Oregon winters. Chilled and soaked, we rush toward warmth and light and people. Afternoon. Café Le Courlis, Cuisine Normandy. We duck inside to escape the wet and find a bathroom. We accomplish both and find, too, a Parisian affair. We score a tiny two-seater table beside a glass door, in a little nook with a prime view of the spectacle seated outside. Indeed, the French have an affair with lunch. White tennis shoes tap beneath tables as women blow smoke into the slowly emerging sun. At 2:30, the place is still spilling with people: a woman with her golden retriever, squirming around her ankles. A stylish damsel flicking fingers across a laptop. 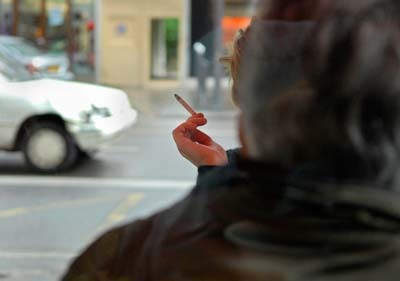 Another young woman with, perhaps, her mother sitting in that so Parisian way—golden hair knotted behind her head, smooth face and perfectly plucked brows, black attire and boots to the knee, cigarette to the side. Everyone chatters. It’s been days since I’ve eaten a proper amount of greens. 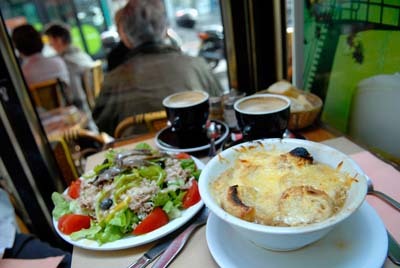 I order salade Nicoise; Jerry the soupe à l’oignon gratinée (A friend who grew up in Paris later tells us this is a soup he has never understood because he knows no French people who eat it. Only tourists…. But that’s another story.). We enjoy our food and a couple of strong espressos. 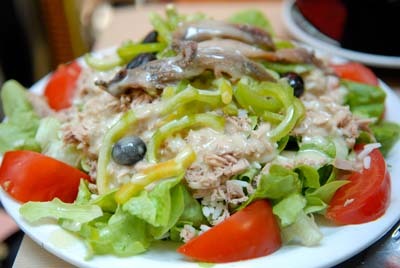 The tuna tastes fresh, the bright red tomatoes ring my plate in a burst of color. It’s a mound of fresh greens, anchovies, black olives and thin pepper slices. Two gray-haired ladies in the corner rasp intently over slabs of beef, round house fries and a half carafe of red wine. Behind them, a smartly dressed woman meets a distinguished bearded man; she wields knife and fork with precision and hardly ever removes her eyes from his. I think of a French movie I watched somewhere—an airplane? a Vientiane hotel?—in which a middle-aged man and woman commence their weekly rendezvous with strong drinks and a Parisian lunch. By 2:50 the dining room empties. The young bow-tied waiter takes a break. He and his colleagues have put their hip-slung bottle openers to good use this afternoon amid the rain, the crowd and a propensity for wine. By now, the drizzling has stopped and the luncheon affair has ended. If the French don’t eat French onion soup on a rainy fall day, well, they’re stupid. It was tres, tres tasty. I can only say one thing, ‘Long live old-fashioned notebooks and smart, hungry-for-life authors who use them!’ Karen, that was beautiful! Don’t make blanket statements about French people…..like I say to French people: don’t make blanket statements about American people !! Jerry, I know you love the French AND the soup! And the wine, of course. Anya, thank you! I always use a notebook. Kathy, the only blanket statement I’ll make about that day: a delicious lunch, just what we needed. I thought the soup looked good too. What do the French call Bastille Day? Joan, French onion was one of my favorite soups as a child and I still love it. It’s La Fete Nationale or Le Quatorze Juillet.